The Living Kitchen is the show where real food, food intolerances and preparedness become a sustainable lifestyle. 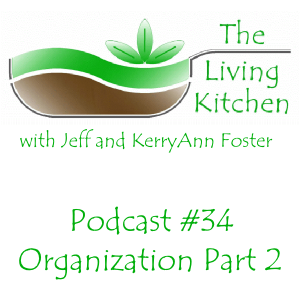 This week on The Living Kitchen, KerryAnn and Jeff discuss how to organize your preps in part two of this series. In this episode we cover creative ways to store preps in every room of the house and space-saving ideas for other household items to give you more room for your food storage. All of the ideas in this series on food storage organization and more are on our Food Storage Organization Pinterest board.